12th October this year was observed as ‘anti Columbus Day’ in Bangalore by the National Adivasi Alliance along with journalists, lawyers, filmmakers and people from many other walks of life. Calling the so-called ‘discovery of America’ by Christopher Columbus as a day of disaster for indigenous people speakers at the event drew attention also to the plight of Adivasis, the indigenous people of India. The occasion also saw the release of ‘Forest, Earth, Water, Sky’, a book that gives a history of the Adivasi Sangama movement together with infographics depicting the socio-economic and cultural profile of Adivasi populations in the country. The book was released by Dr. Rajan Gurukkal, former Vice-Chancellor of Mahatma Gandhi University, Kottayam and Prof. Muzaffar Azadi from the Department of Political Science, Mysore University. Adivasi activists from Nagarhole, J.K. Thimma and Navitha presented the book to the academicians. Releasing the book, Prof. Rajan Gurukkal said that the condition of the Adivasis in India was shameful and their Adivasis themselves need to lead the movement for their empowerment. V.S. 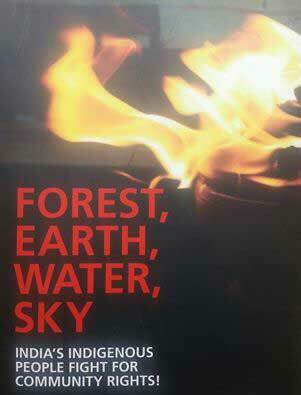 Roy David, Secretary of the Coorg Organization or Rural Development (CORD), publisher, said that the publication of the ‘Forest, Earth, Water, Sky’ book was part of the Adivasi Sangama movement, which was launched in the early nineties to highlight the problems of the Adivasis. The decision to bring out such a book was taken at the Community Rights Sangama held at Kushalnagar, Karnataka from 9-12 October 2011, that brought the Adivasis, on a common platform, with forest dwellers and fisher people. Professor Muzaffar Azadi from the department of Political Science, Mysore Univeristy, talked about the importance of documentation of Adivasi resources, particularly land and forests to be able to claim their rights to them through the legal process. J.P.Raju, Convenor of the Indigenous People’s Forum, Karnataka spoke about the neglect of the forest based Adivasi population of the state and their harassment by officials of the forest department. He said the Adivasis of Karnataka will launch a campaign for autonomy to ensure their rights unless the government responded to their long-standing demands. K.N.Vittal, President of the Budakattu Krishikara Sangha(Tribal Cultivators Association) condemned attempts to force Adivasis to declare themselves to be ‘Hindus’. He said that the identity, culture, languages and way of life of Adivasis was under severe threat from the ideology and political movement of ‘Hindutva’, and this needed to be strongly resisted. Satya Sagar, who edited the ‘Forest, Earth, Water, Sky’ book, said that Adivasis in India, like other indigenous people around the world, were at the bottom of Indian society in terms of most social and economic indicators. This, he said, was due to the systematic colonization of Adivasis by migrants, settlers and invaders coming into the Indian sub-continent over 5000 years. According to Sagar it was important to go beyond pointing to data and facts and challenge the crude and racist characterisation of Adivasis by Hindu mythology, which refers to them as ‘rakshasas’. The Ramayana he said was the founding myth of the Aryan settlers who took over the land and resources of the original people of India through a mix of conquest, cooption and compromise. From the Adivasi point of view all the ‘demons’ of Aryan mythology should be recognised as heroes who defended Adivasi territory and rights whether it be Ravana, Vali or Mahisasura and their tales need to be retold in a new way. Sagar also pointed out that not only were indigenous people the oldest surviving civilisations on Earth they were also the only ones who could protect the planet from ravages of environmental destruction and urban-industrial ‘civilizations’ created by so called modern cultures. It was time for Adivasis to stop fighting defensive battles and go on the offensive to assert the superiority of their worldview and lifestyles. The programme was organized by National Adivasi Alliance.